These days, we rely on our smartphones for just about everything. They function as a computer, an MP3 player, a camera, and a GPS. We need them to make calls, send emails and text messages, update social media, take and share photos of our trips, and navigate foreign cities. The very thought of being disconnected from all of that can be slightly terrifying, especially while traveling to a new place. However, the fear of unwanted roaming fees, data charges, and connectivity issues often leads people to leave their phones at home or in their hotel room. But there’s good news — it doesn’t have to be that way. First of all, you probably will not actually need your phone or the internet as much as you might think. Consider this opportunity to “unplug” while you travel as an invitation to experience the world vividly again, with all of your senses and attention intact. Lift your eyes from your screen so that you can see new skylines and vast landscapes as they are, and not as they appear through an Instagram filter. Put away your phone so that you can free your hands to feel the textures of ancient castles or crumbling ruins or faraway seas. Take off your headphones, and pause to listen to the conversations around you in languages you don’t understand. Liberate yourself from the compulsive need to read every email, Facebook notification, and text message the moment that you receive it, and marvel at the fact that life carries on anyway. All of that being said, there is also joy in sharing your travel experiences with others back home. And there is peace in knowing that you can be reached if there’s an emergency at home or at work, or in letting your loved ones know that you made it safely to your destination. So if you’re not quite prepared to go completely offline during your next trip, here are a few tips to help you stay connected without breaking the bank. For some people, adding international service to an existing phone plan is an appealing strategy for keeping in touch while traveling. First, think about how you might use your phone during your trip. Will you be making or receiving a lot of phone calls? Do you need to be reachable at all times? Do you require regular access to your email? If so, you might consider signing up for an international plan with your service provider. Although you can still make calls, text, or use the internet without one, the “pay-as-you-go” prices and roaming charges can get really expensive. An international plan can help cut down on some of those costs, and may be a more economical choice. Check with your service provider to learn more about what international plans they offer, and then simply cancel international service once you return home. 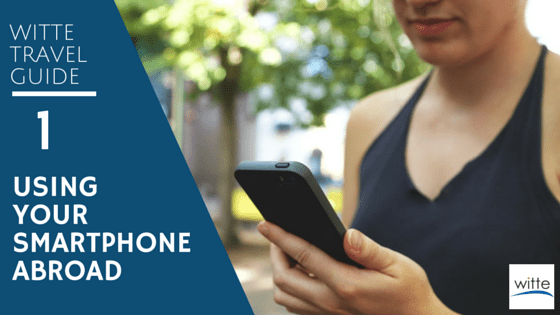 On the other hand, if you can be more flexible about when and how you can be reached on your phone while traveling, there are lots of alternative options that allow you to use your smartphone abroad for free or at a significantly lower cost. Before your international flight takes off, make sure that you put your mobile device on Airplane Mode. Activating the Airplane Mode setting disables the device’s signal transmitting functionality, and prevents the device from making or receiving calls, using text messaging, or accessing the internet without a WiFi connection. This ensures that you can still access your camera, music, games, podcasts, and other content downloaded onto your phone without having to worry about roaming charges! Activating Airplane Mode (sometimes called Flight Mode or Offline Mode) is very simple to do. On most devices, you’ll find it in your Settings menu. If you need help, a quick Google search can yield detailed instructions for Android phones, iPhones, BlackBerry, Windows Phone, etc. If you’re still not sure how to switch on Airplane Mode and how to turn WiFi on/off, just ask your cell phone provider to show you, or send me an email and I would be glad to help! In many countries, it is fairly easy to find WiFi—often for free. Once you are connected to a WiFi network, you can use the internet to check your email, upload pictures to social media, and even make phone calls! Many hotels, restaurants, cafes, shops, bars, and even gas stations offer WiFi, although you may need to ask for a password in order to log on. WiFi isn’t always free. For example, some hotels may charge you to use WiFi, so don’t hesitate to ask about the policy if you’re not sure. Other places may limit the amount of time that you can use WiFi for free (often 30-60 minutes), with the option to pay for continued access. If you plan to sit at a café or a restaurant to take advantage of free WiFi, it is polite to purchase a beverage or a snack in return. Besides, sipping a local beer or munching on a croissant while checking your email and observing the culture around you is a great way to spend an hour in a foreign place! All of these apps are free to download and to use, although some of them offer premium features for a small cost. All of these apps require a WiFi connection to use. It’s a good idea to download any new apps onto your device before you leave home, when you don’t have to worry about limited bandwidth. Pros: It’s free to communicate with other Skype users, but you can also use Skype to make international calls or send text messages to any mobile phone or landline worldwide at a very, very low cost. Pay-as-you-go rates using Skype Credit are just pennies per minute, or you can buy a one-month subscription for $0.60-$3.00 to get unlimited calling at even better rates. Even if you don’t anticipate making phone calls during your trip, I highly recommend that you buy $5 of Skype Credit just in case—it never expires, so if you don’t end up needing it then you haven’t lost anything, but you can save a lot of money if you do have to make an unexpected international call. Here’s an example: During a recent trip to Denmark, I was having problems using my debit and credit cards even though I had notified my bank that I would be traveling. I had to call the number on the back of my card, and then I was transferred to several different departments and put on hold multiple times while they tried to figure out what the problem was. The entire call took at least 30 minutes, and pay-as-you-go rates for international calls on my normal cell phone plan cost about $3/minute. On top of being stranded in Denmark with no access to my money, I could have been charged $90 for that necessary phone call, but instead I paid less than $1 using Skype. Cons: The quality of voice calls and video chats isn’t always great, especially if you have a low wireless signal or if you are using a public WiFi network. Similarly, FaceTime is the built-in videochat app on iPhones and iPads, and you can also use it for voice-only calls. To find out if the person you are trying to reach also has an iPhone, open up your phone’s Contacts and pull up their name. If that person has an iPhone, you’ll see a FaceTime option underneath their phone number. Check out this helpful Triphackr article for more information and instructions for using your iPhone abroad. Cons: You’re limited to using iMessage and FaceTime only with other iPhone users. Pros: This is just another option for sending free text messages. You can message other WhatsApp users on any smartphone. Cons: It’s still catching on, so the people that you wish to contact may not have it installed on their phones yet. Compatible Devices: Facebook Messenger—any computer, smartphone, or tablet. Pros: Facebook Messenger has been around for a while now, and is a reliable way to send text messages to other Facebook users on any device. Recently, Facebook has added video chat and voice calling to their messaging feature, and although it doesn’t offer anything new that you can’t get from Skype or FaceTime, the benefit to using Facebook is that you can reach anyone with a Facebook account—which is a lot of people. Cons: Facebook Video is not my favorite way to video chat or call people when I’m traveling abroad. Because those features are fairly new, there are still some bugs to work out. For one thing, although you can use your phone to send text messages to your friends using Facebook Messenger, the video and call features only work on a computer—and only if you use certain internet browsers (Google Chrome, Firefox, and Opera). You also have to set up the video feature, which means that your Facebook friends also need to have it set up before you can video chat with them. “What do I need to do in order to use my phone during my trip?” is one of the most frequently-asked-questions that we get on a daily basis. As technology advances more and more every day, WiFi availability continues to improve worldwide and international communication becomes easier. But, as the options grow and vary, it can be tricky to stay on top of the latest developments. My favorite resource is Rick Steves’ Travel Tips: Phones & Technology. He offers lots of really great suggestions for internet calling and messaging, smartphone travel apps, and internet security for travelers. Although his information is geared towards European travel, much of what he says can apply to just about anywhere. We want to hear your favorite tips and tricks for staying in touch while traveling– Share your ideas with us in the comments or on Facebook, and if you have any other questions about using technology and smartphones while traveling, let us know!